The Digital Games Research Association is the premiere international association for academics and professionals who research digital games and associated phenomena. 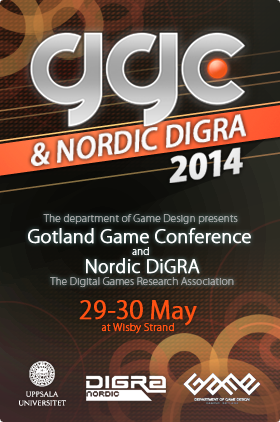 This year, Nordic DiGRA is teaming up with Gotland Game Conference on the paradise island in the baltic sea. Running along side GGC, we will be showcasing papers on the subject of Gamification and how game systems are becoming more pervasive in every day life. Innovation and transformation at GGC, Gamification and application of design at DiGRA Nordic. Discussions of the relation between the player and the figure under her control have identified a duality between the figure as ‘avatar’ and ‘character’. This paper argues that two separate dualities are being conflated: an ontological duality in the figure, by which it is both self and other for the player, and a duality in the player’s relation to it, which can be both subjective and objective. This insight is used as the basis for developing a two-axis model that identifies four aspects to the player-figure relation. This model is then put to work on a close analysis of a scene in Kentucky Route Zero (Cardboard Computer 2013), which will serve to demonstrate the dimensions of the player-figure relation. In this article we present the hermeneutic method as a tool for analyzing game studies discourses. We use Markku Eskelinen’s profusely interpreted “The Gaming Situation” (2001) as a case study. Our premise is that whereas the hermeneutic method is academically well-established, its conscious application is not. It is suggested that with conscious application of the hermeneutic method the persistent and problematic questions in game studies, like those related to narrative, definition, and art, gain potential to be treated with increased sophistication. World War I (WWI) has a relatively unusual presence in popular memory and historical videogames have rapidly become one of the most successful forms of popular history. Despite this, there is very little research that examines the representation of WWI in videogames. This article provides an overview of WWI games, organising them by genre and determining their engagement with WWI popular memory. Secondly, the article explains the issues that face videogames in trying to engage this memory, particularly given its relatively controversial and contested nature. Thirdly, using frame analysis, the article suggests a number of reframings which videogames that engage with WWI popular memory seem to use to negotiate these issues. Accordingly, the analysis reveals the nature of depictions of WWI that players are exposed too in this new popular form. Furthermore, in doing so, the current limitations and possibilities of videogames as a historical form are further explored. This paper investigates the free-to-play revenue model from the perspective of game professionals. To court larger player audiences and to address their wide willingness-to-pay spectrum, game developers have increasingly adopted the free-to-play revenue model. However, at the same, worrying concerns over the revenue model have been voiced. For example, free-to-play games have been deemed as exploitative and unethical. We investigated this contrast by conducting a thematic interview study. We employed grounded theory in the analysis of the data containing 14 game professionals’ interviews about their views on the free-to-play model. The results show, that the free-to-play model is something that the developers view favorably while the public writing about the games can even be hostile. The games have evolved, while the voiced opinions still talk about games of the beginning of the model. Relatively few ethical problems were seen that would address the whole model, and the future of the free-to-play games was seen bright.